I have a confession to make: I play Tiny Tower on my iPad. My 6-year old granddaughter got me started. She discovered it on her grandfather’s iPad. When her sister was using Grandpa’s iPad, I downloaded it on mine to maintain sibling stasis. I’m sure she’s moved on to other things on her Papa’s iPod Touch, but now I’ve almost got the entire Tower built and occupied! I’ve never been much of a game player. Scrabble was the only game I had on my iPhone and my husband won’t play with me. He says I’m too competitive…which is true. I did not grow up with video games. I used a slide rule and typewriter all through college and grad school! Not even a calculator, for goodness sakes! I think there was a pinball machine in my dorm at UCLA which gives an idea of how many decades ago that was! Tiny Tower lets you build and manage businesses and bitizens that inhabit it. The bitizens BitBook is the virtual social network for the bitizens and lets you see what’s on their mind. Somebody help me, I’m being spontaneous! People can be so two dimensional sometimes. How many bits would a bitizen byte if a bitizen could byte bits? I think there are some angry birds trapped in the ventilation. How do you get the elevator to go? Divine intervention? Sometimes I feel like a nut. Sometimes I don’t. Just saw a ghost! 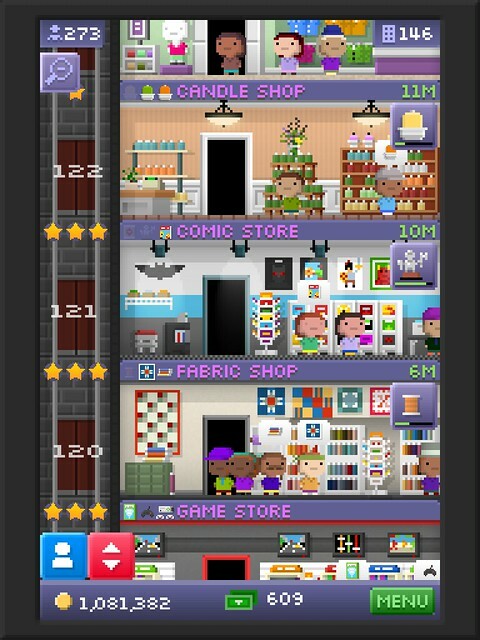 Tiny Tower is haunted by the ghosts of evicted bitizens! Have you ever wondered if we all exist inside a computer simulation? Sometimes I feel like we’re all born out of a little app icon. I know, sounds nuts. TGIF! I think … Actually I have no clue what day it is. I’m not a complete idiot. Some parts are missing! Sometimes my life feels like it’s in someone else’s hands. If you see gum on the floor, leave it there. It isn’t free candy. The only job you start at the top is digging a hole. Storm’s brewing. I can feel it in my pixels. The truth is out there. Does anyone know the URL? A life? Cool. Where can I download one of those? I’m in my own little world, but it’s okay. They know me here. I used up all my sick days so I’m calling in dead. Next PostNext Is It Our Place?